Inbound marketing can be defined as a process of marketing which is completely dependent on the concept of capturing the attention of your prospective customers, making your business or your website easy to find and drawing online users and prospective customers to your site by making sure that you produce contents that are valuable to them. Among the best examples of inbound marketing are videos, podcasts, blogs, eBooks, whitepapers, social media marketing, search engine optimization (SEO), e-newsletters and any other type of content marketing. Inbound marketing is also known to cover three major phases and these are getting found, conversion and analysis. It should also be noted that the newest model for the inbound marketing concept comes in five basic stages and these include attracting traffic, converting website visitors into leads, converting leads into sales, turning customers into repeat customers that provide higher profit margin and analyzing performance with an aim to improve continuously. Inbound marketing focuses on three effective marketing techniques namely social media marketing, SEO and content marketing. The entire inbound marketing process can also be defined as a more integrated form of marketing as it works in connecting together different channels and methods of marketing with an aim of developing a more powerful brand and a stronger presence online. One of the major advantages of inbound marketing is the fact that it works effectively in reaching a highly targeted market or audience since it goes after those who are greatly interested on what your business offers. 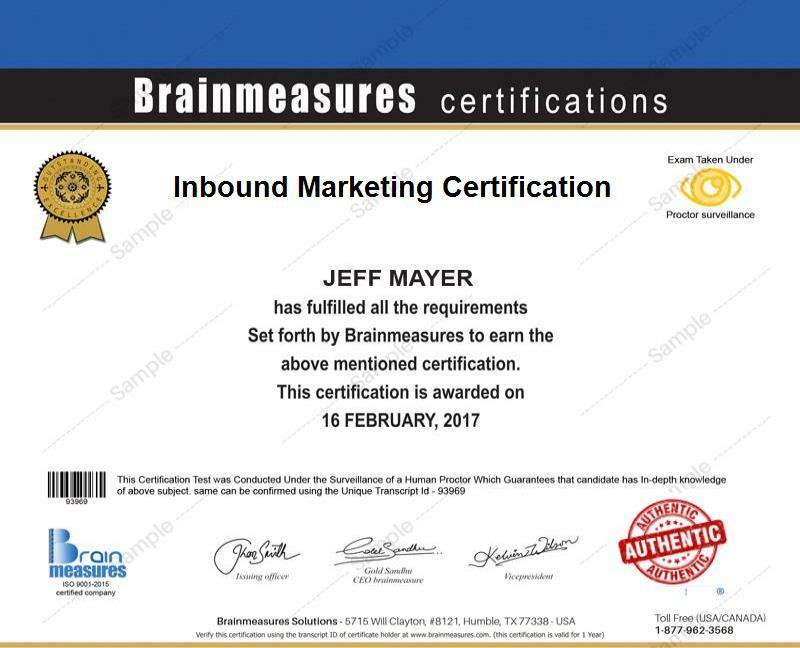 If you are interested about improving your knowledge and skills in inbound marketing, then be aware that Brainmeasures, a highly reputable online certification company, offers a reliable inbound marketing certification course. This inbound marketing course from Brainmeasures is guaranteed to help you become a certified professional in the field of effectively handling various inbound and online marketing campaigns. You can expect this certification course to be a huge help in honing your skills and knowledge about inbound marketing as long as you really have a strong interest in getting an inbound and online marketing certification. The comprehensiveness and accuracy of all the information taught in the course are among its strongest points. You can also expect the program to test your knowledge about all the concepts and strategies linked to inbound marketing through an online exam developed by experts. This is an inbound marketing exam which aims to determine your worthiness to receive an inbound marketing certificate. The inbound marketing certification program which is now offered in Brainmeasures can benefit hundreds of individuals and professionals who are working in various industries. You can expect the certification course to work perfectly for business owners, marketing professionals, key business decision-makers and senior executives who are aiming to improve their proficiency in using the internet to effectively implement, communicate and assess their business goals, strategies and objectives. The inbound marketing certification program is also designed for professionals in the public relations, marketing, sales and advertising department of an organization who are responsible in developing inbound or online marketing campaigns that are effective in improving its performance. Inbound marketing certification holders can also expect to earn a substantial amount of income considering the huge demand for their skills, knowledge and services. If you hold an entry-level inbound marketing position, then your salary can be expected to range from $30,000 to $90,000 annually. More experienced inbound marketing certification holders can expect a competitive salary which can start from $132,000 per year.